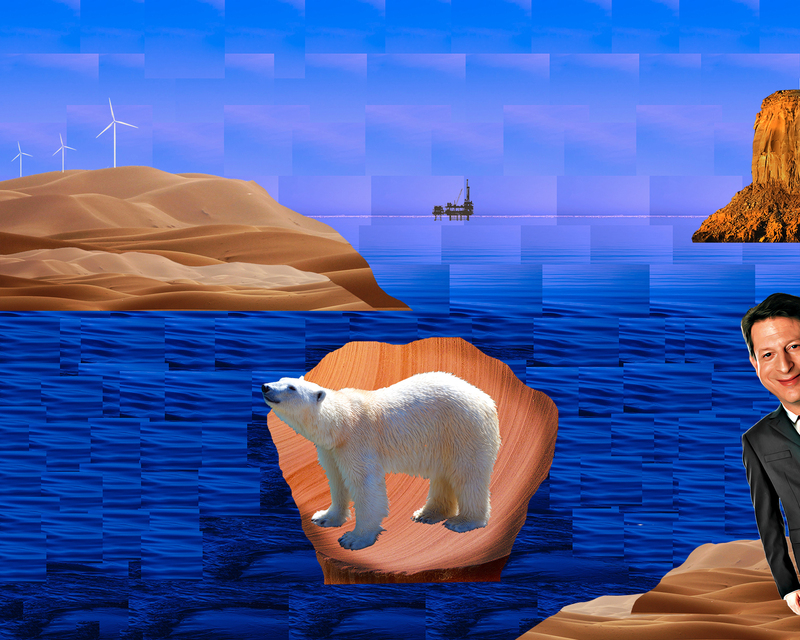 The imagery that I found for this project was found through Pixabay.com and they consist of desert landscapes and man made structures such as wind turbines and an oil rig. I chose these photos for my collage because I felt they could help me send the message I was trying to convey. Using these desert landscapes in conjunction with an choppy ocean view one can see that these do not belong. My main inspiration for the construction of the separate piece was the painting by Sandro Botticelli “The Birth of Venus”. In my research of the painting I found that interpretations of this painting have to do with the beauty that is the goddess Venus in that moment. In pairing that message with the images that I chose I want to viewers to thinking about the beauty that we may be losing to climate change. In the story of the “The Birth of Venus” the god of wind is pushing her towards her keeper on her right side. In my interpretation there are wind turbines pushing a polar bear to a charachatured Al Gore who is the creator of the popular documentary film “Inconvenient Truth” warning of the impending doom caused by climate change. Although there was research/ background information used to create this I still believe the message is clear and stands alone through the images I chose. I believe my image to have good contrast all of the image stand out from the different blues in the background. I feel my collage employs a good balance between all of the images on the page, they do not over power the eye in one specific direction. Another element of design I used was repetition as most of the background repeats it self to shape the background that can be seen. The specific tools that were implemental in creating this piece were many selection tools. For the smaller selections with one or two colors I used the Select> Color range option, this was very helpful for the things that were too thin or small to capture using quick select or cut it out with any of the lasso tools. For the background I used just a selection tool so I could copy the same chunk of background over and over. This caused me to lose the work aka the layers for the background as I did not know that flattening the image is not something one does till the end of the project as to not lose layers. For the larger parts of my collage such as the desert cut outs and other rocky structure cutouts I used the the regular lasso tool to cut out the shapes that I wanted since I did not need to select specific pixels I used that tool to get the shapes and cutouts that I wanted.For this work specifically I do think that creating it under a digital medium adds to its message and construction. Someone the piece in the work are too thin to be able to translate into a non-digital medium.